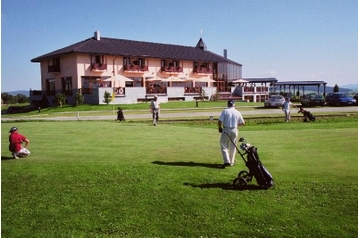 Hotel on the outskirts of the village Veľká Lomnica. In the hotel / complex there is: restaurant, terrace, lobby bar with fireplace, cofee bar, dayroom with TV-SAT, videorecorder, meeting rooms (telephone, internet access, projector, projecting screen), winter garden (50 persons), VIP lounge (10 persons), billiards, summer pool, garden grill, sandpit, swing. 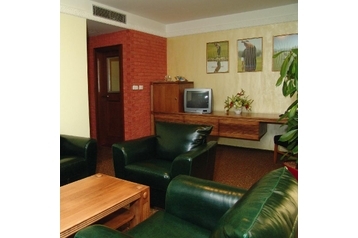 Included in the price: relax centre (indoor swimming pool, fitness, dry sauna, steam sauna). For an extra charge: sport equipment rental, party game rental, exchange office, golf simulator, professional 18-hole golf course. Small childrens bed available, room suitable for disabled. Parking - guarded, free of charge (snow chains). Bus 2km. Train (station Veľká Lomnica - Studený Potok) 3km.